The Lexus people are a little tired of being overlooked, as if they were some flyover state in the land of prestige brands. Back in 1989, their LS400 stomped the German prestige brands flat with new standards of comfort, drivability, and reliability, and yet Audi, BMW, and Mercedes-Benz still dismiss Lexus with a casual wave of the hand, just as they did twenty-five years ago. Instead of just sitting on its success in the American market, Lexus decided to make an international statement. 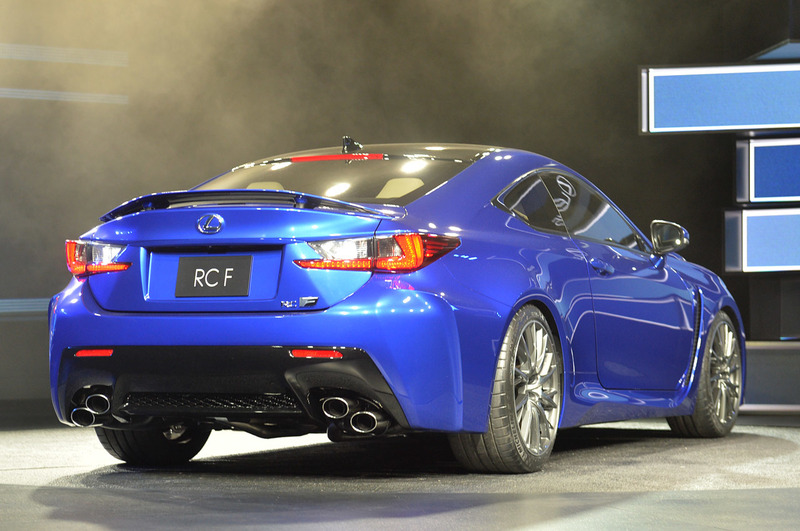 The RC-F is part of that statement, and it’s a message that has been on the way to us for a while. It wasn’t a coincidence when Toyota created its own Formula 1 racing team from scratch and hit the track in 2002, even before BMW and Mercedes-Benz bought pre-existing F1 teams. The Lexus LFA wasn’t just a high-tech toy when it debuted as a show car in 2005. The Lexus IS-F sedan wasn’t simply an imitation BMW M3 when it came on the market in 2008. By the time the LF-LC concept arrived at the 2012 Detroit show, it was clear that Lexus was serious about building sporty cars. Now the production-ready RC-F finally lies before us, although it’s wearing showcar colors and the specifications aren’t quite finalized. (RC stands for “radical coupe,” and F is a traditional Toyota code for special projects, notably the F1 that became the LS400.) We embrace the classicism of the rear-wheel-drive coupe’s proportions, the long, dramatic sweep of the hood matched with an upright cabin at the rear. The RC also has real style. The shape seems as if it’s interacting with the flow of air around it instead of simply pushing it aside, and you can almost see the vortices swirling off the sheetmetal. While some dismiss this look as “origami styling,” we like its futuristic newness. In comparison, cars from the European nameplates often look as if they are simply different lengths of each brand’s corporate sausage. The upcoming Lexus RC350 has much the same look as this, yet the RC-F is notably unique for its carbon-fiber roof and optional carbon-fiber rear wing. This is the largest version yet of the spindle grille that has become the signature of Lexus, and we can now see it and no longer hear Darth Vader saying, “Luke, I am your father.” Within the RC-F’s cabin, you find the same architecture as the RC350 in the sweep of the dash and the swoop of the center console. The F is set apart by the TFT display for the instruments, which allows you to change the array in a way that suits the moment, whether it’s street or speed. Beneath the styling, the RC-F gets tough. It’s built on a version of the Lexus IS platform, and the wheelbase has been made 2.8 inches shorter to match the 107.5-inch wheelbase of the outgoing IS-F sedan. The RC structure mixes high-strength steel, laser screw welding, and structural adhesives for optimum rigidity, while the F gets further structural braces for even more strength. Overall weight distribution is balanced toward the front, and it is not a bad strategy because it gives the car a surer sense of direction when the speedometer numbers start to get scary. 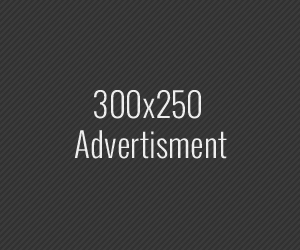 The weight target is a rather husky 3970 pounds. As with the IS, the RC has a controlarm suspension in front and a multilink setup in the rear, and the F iteration gets aluminum suspension arms and firmer bushings. Up front, you’ll find the six-piston brake calipers familiar from the old IS-F sedan, but you’ll also find thicker, larger 15.0-inch rotors. At the rear, new four-piston calipers are matched with thicker, larger 11.4-inch rotors. Forgedaluminum wheels with nine-inch rims carry high-performance 255/35YR-19 front and 275/35YR-19 rear Michelin Pilot Super Sport tires. Of course, everyone really wants to know what’s under the hood. You’ll find the same cast-aluminum block that’s now doing business in the IS-F, but everything else about this DOHC 5.0-liter V-8 engine has been revised. Lightweight titanium valves are again matched with strong, forged connecting rods, but there are new cylinder heads that still incorporate variable valve timing on both the intake and exhaust cams. The polished crankshaft is smaller in diameter to reduce friction, while the pistons reduce friction as well. Naturally the intake manifold and exhaust headers are new, and the exhaust barks with a sharper, louder note. The dynamometer numbers aren’t yet final, but we’re told that this engine spins faster than before to deliver at least 450 hp and 384 lb-ft of torque. 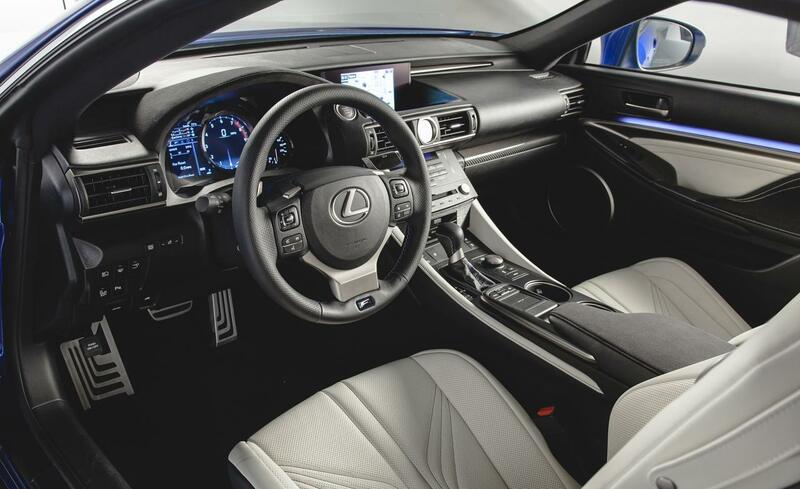 We shouldn’t be surprised that an eight-speed automatic transmission is part of the high-performance program, as it delivers the drivability Lexus wants as well as the necessary durability. It’s calibrated to lock up in second gear and above for crisper response, it delivers gearchanges from the shift paddles in less than 0.2 second, and it blips the throttle automatically for quicker downshifts. Just as important, the electronic programming for the transmission, chassis, and stability control includes no fewer than three modes suitable for track driving, plus there’s an optional torque-vectoring rear differential. The array of sensors that operates stability control even includes a rear-ride-height function for those times when, you know, the car is airborne after crossing a crest at the Nordschleife. The RC-F fits into the ongoing transition of Lexus into a brand with more aspirational overtones. 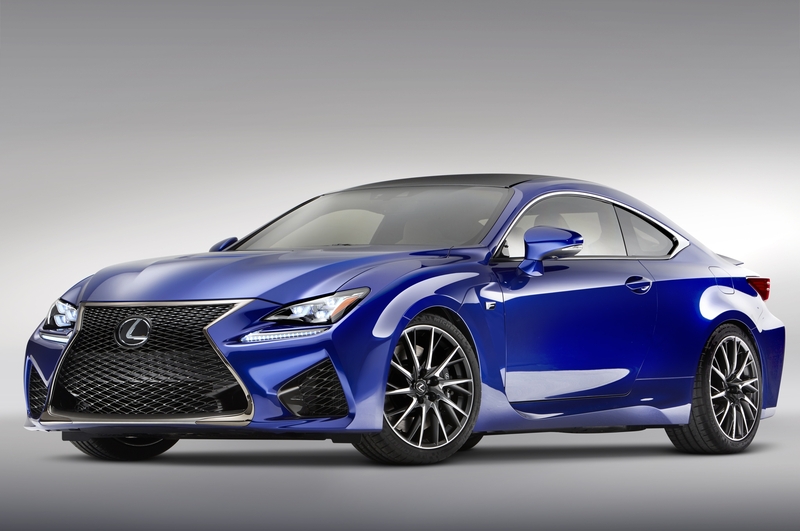 The RC-F supports the new Lexus F Sport models that have been rolling out, giving the brand a pyramid of premium cars for customers to climb. The RC-F sits near the top of the pyramid, and we hear that a version of the supersporty LF-CC concept car is also on the way. All this has much to do with Akio Toyoda, the president of Toyota Motor Corporation since 2009 and a member of the board of directors since 2000. He embraced the LFA when it first appeared as a concept car, and he has been around the Nordschleife a few times himself. Toyoda has driven in endurance races staged at the Nürburgring several times since 2007, and he has become friends with Ulrich Bez, Aston Martin’s president, who also regularly races the Nordschleife. In fact, they swapped cars with one another in the last driving stint of a 2011 event, so Bez crossed the finish line in an LFA Toyoda drove across in a V12 Zagato.